“Suddenly, the wind tipped the whole cabin over- carried everything out to sea…. The waves were terrific big things.” (Joseph M. Lyndon, as told to a Miami news reporter, quote later reprinted in the September 5, 1935 Cullman Tribune). “I was washed into the gulf by a high wave.” (Joseph Factsau, as told to a Miami news reporter, quote later reprinted in the September 5, 1935 Cullman Tribune). CULLMAN – The above quotes- from survivors of the destructive 1935 Florida Labor Day Hurricane- demonstrate the force some hurricanes are capable of. Spring tornado season may be winding down, but there is another severe weather season around the corner that can affect the Southeast: hurricane season, which is typically considered to last from June to the end of November. 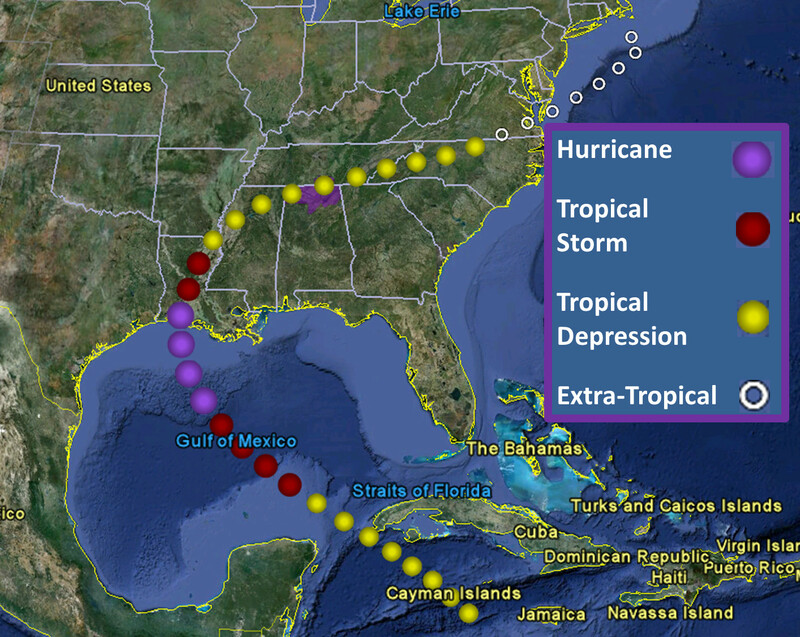 While hurricanes do not affect northern Alabama directly- once hurricanes move inland, they are classed as either tropical storms or tropical depressions rather than hurricanes- the region can experience the effects of tropical storms if they hold together. Even a weakened tropical system can bring dangerously high winds and torrential rainfall, and tornadoes are also a possibility depending on what side of the storm you happen to be on (the right sides of hurricanes generally experience severe weather). Because of this, it is a good idea for inland locations to pay attention to hurricane forecasts, in particular to a hurricane’s track, and review both flood safety and severe weather safety to be prepared for power outages, downed trees and downed power lines. Most tropical systems that have affected north Alabama over the past few decades- such as Andrew, Opal, Ivan, and Katrina, to name a few- have brought mostly wind and heavy rainfall, leaving behind primarily downed trees and power lines. However, there has been at least one system- Danny, in 1985- that caused tornadoes. Even though Danny weakened to a tropical depression by the time it reached north Alabama, the combination of strong shear and instability with the remnants of the tropical system spawned a tornado outbreak over north Alabama on Aug. 16, 1985. Five of these tornadoes were in Cullman County, including one long track F3 that tracked through the eastern side of the county. Substantial structural damage was reported in Cullman County, and numerous trees and power lines were downed. At least one fatality was reported, along with many injuries. Information from the National Weather Service in Huntsville was used in this report. Next articleGet in the ball!